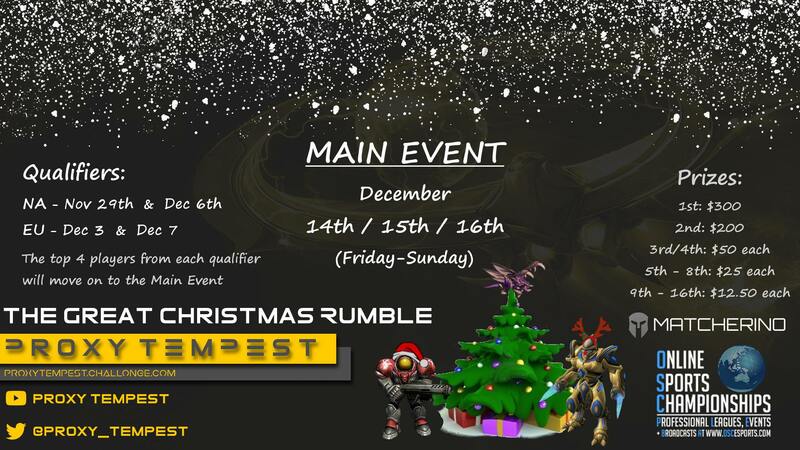 With the kind support of OSC and Matcherino, Proxy Tempest is proud to present The Great Christmas Rumble to round up a successful and long year of tournaments! 2 for NA, 2 for EU, each of them is replacing the respective regular Open tournament on the days they are held, but award no prize money initially. Top 4 of each qualifier will proceed to play in the main event. The main event is a single elimination bracket consisting of 3 days, with 5 series being played on each of the days. Series are Bo5 until the semi final, final is Bo7. It is possible to pre play a series if one of the players qualified has no possibility to play on the main event day, but the focus should be to play the series live. Now that I’ve outlined the general format, and what is on the line, let me get into more detail for the event. Below, you will find all qualifier dates and times, including sign up links, as well as when the main event takes place. All qualifiers are open global. Please see the full ruleset on the respective sign up pages. You can support the event by stopping by at the events Matcherino page, using the code “PTXMAS”, or by having a look at the rewards and stretchgoals mentioned on the page. For questions, don’t hesitate to join our Discord server. I know it won't happen but I kind of wish Serral would go ham on OSC tournament for the rest of the year, it would be hard for him to make the top 50 in time for the championship but it would br nice to follow his run. But still there are other very good player who are just outside of the top 50 should be nice to see who can make it. Also, this tournament should be great!